Scientists have reported that ice in Antarctica, roughly equal to the size of California, had melted in 2005, adding to fears that sea levels will rise and the salinity of the oceans would be drastically altered enough to affect life on Earth. The report is based on satellite data from NASA's QuikScat which detected snowmelt using radar. 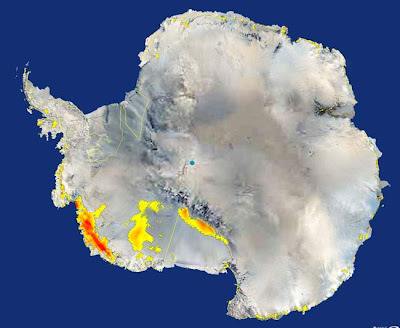 Konrad Steffen of the University of Colorado in Boulder says "Antarctica has shown little to no warming in the recent past with the exception of the Antarctic Peninsula. But now, large regions are showing the first signs of the impacts of warming as interpreted by this satellite analysis."